I've never been the fastest cat on two wheels. But then, I've never wanted to be. I love the motion and movement of bicycling for its own sake. This bicycle is a project which has taken nearly ten years to complete. In that time, I've seen a few trends come and go. I always seem to come back to what is uncomplicated and reliable. When I finally had the time and resources to teach myself how to build a frameset, I decided to make something comfortable, stable, and simple. And fun to ride too. 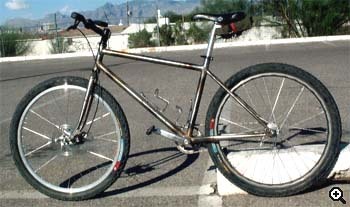 My plan was to build was a fixed gear mountain bike in lugged steel. It would be rideable in all all kinds of weather. This meant no rear brake and a disk brake in front attached to a steel fork with a nice-looking curve for the offset. I chose steel because I'm familiar with silver brazing through my day to day work making the mechanism for concert flutes. I opted for lugs because they're somewhat self-jigging and I love the traditional look on an otherwise modern bike. I feel in large part that I accomplished my goals. The complete bike reflects my style. It's simple. It has no suspension of any kind other then the flex in the frame/fork and in my arms and legs. In fact, it doesn't even have a rear brake! But, from the very first ride, I felt the quality I value most: stability. And, uh, 'fun-ness': the quality of being fun to ride. I can stand on the pedals while climbing without any weird body english or slippage at the rear wheel. I can also negotiate singletrack at speed while keeping the rubber side down. That's pretty neat, considering that it has usually taken months of riding for me to dial in a new bike. 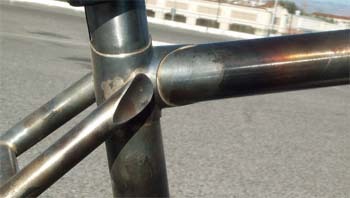 Frame geometry was a key factor in achieving this quality. I built to a standard 71/73 with a 22" TT and a 12.25" BB height. (Next time it'll be something like 72/72 for a long top tube and faster front end.) The wheelbase is on the order of 42" and the fork rake is 55mm. It's still not completely done. The frame needs some finish-filing, and the whole thing needs to be painted. But in it's present state, it's a good illustration of how I assembled the frame and fork. As of two months ago, it's been my primary ride. Even in it's unpainted/unfinished state it's a source of great joy. Next on the books is a 700c bike with horizontal dropouts and a Richard Sachs fork crown. It will also feature a Zero tubeset--the lightest steel that Dedacciai makes--plus a set of Henry James lugs. It will be designed to fit 44mm Mutanoraptors with fenders and a front disk brake. Mark Kobayashi recently relocated to the Washington, DC area from Tucson, Arizona. His tires are now covered with mud instead of cactus needles and he is very thankful that his bike has only one brake cable and no shifty stuff to worry about. If you're dippping your toe into self-build, Mark Perry has an article on DIY track ends.